Very heavy duty, I think each pack was like 5lbs each. The color is true to picture. I ordered these panels in teal and they match my room perfectly. I haven't hung them up yet so I am not sure if they will block the sun just yet. Will update. The Velvet heavyweight grommet top window curtain panels bring a rich and luxurious look and feel to any room. These beautiful panels are the ultimate finishing touch to beautify any window setting. The Velvet drapery is constructed with gorgeous, matte silver grommets and can be hung on your favorite curtain rod up to 1 5/8" diameter, adding yet another touch to the richness and luxury of your decor. These window curtain panels will drape beautifully from any window that could use that perfect, finishing touch. Our curtain panels are perfect for any living room, bedroom, family room, dining room, bathroom and office. Our stylish designs will suit any window space. Dimensions 63.0 In. X 54.0 In. X 0.2 In. These are nice sturdy curtains. The material is a nice midweight and they're soft. They do not look like an expensive good velvet, but they're nice for the price. I wasn't thrilled with the color though, it looks much lighter on the website. It only looks true silver if you shine a very bright light on it, most of the time it looks more like a medium gray taupe. They are a level 2 in opacity as stated in the description, so they filter out a bit of light. Definitely would have rated them higher if not for the color issue! I purchased these panels in silver for the guest bedrooms in my new home. They are simply beautiful! I couldn’t be more pleased. The wrinkles steamed out easily. They have good weight to them so they hang well. It’s nice that you get two panels per package. But, I still ordered too few panels for 4 windows. I forgot how much of the width is taken up when you hang grommet top panels. No problem. I’ve placed another order that Overstock will deliver in just a few days. I purchased the teal 108" length for my living room. The velvet material is very appealing and drapes perfectly. The color is true to the picture which is more a green than blue. In the sunlight it looks more green but darker at night. I wouldn't call it a blackout curtain but it is dark and thick enough to keep the light out. 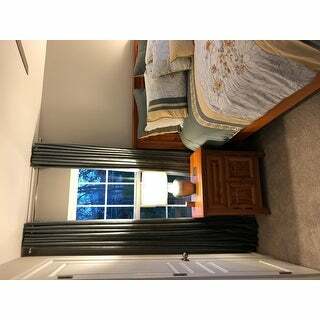 I would recommend these curtains and like the style as a modern look to any home. The price was good and it comes with 2 panels. Thank you overstock for ther options to chat with someone immediately and quick responses. I love my new curtains. Love the velvet curtains. The length was perfect, however the width wasn’t wide enough for the windows I had to add 2 pairs to each window. They are heavy with 4 panels hanging. But they look really nice together. Beautiful curtains! They look so elegant, just the look I was going for! I added some sheers in for coverage but other than that, they're perfect! I ordered 3 more pairs for my other windows. Gorgeous curtains! 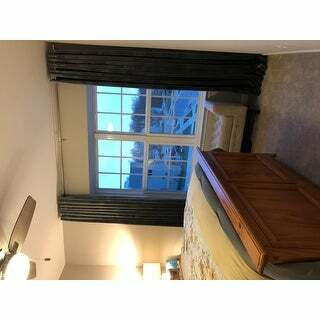 I purchased these quality curtains in teal for my bedroom and they look stunning. I will most likely buy a pair in another color for my living room. These are very elegant curtains. They are heavy curtains made of a good material. Arrived on time and look really beautiful in my living room! Beautiful luxury curtains. Had to return as I needed a darker grey curtain to complement my home decor. I am very pleased with this purchase. The teal color is very rich and I only wish I ordered the 96 inch length instead of the 84 inch. Of all the items I have purchased from Overstock I have never returned anything and have been pleasantly surprised. The material is very cheesy. Don't buy these. I had very high hopes for them. I bought them in the winter white. 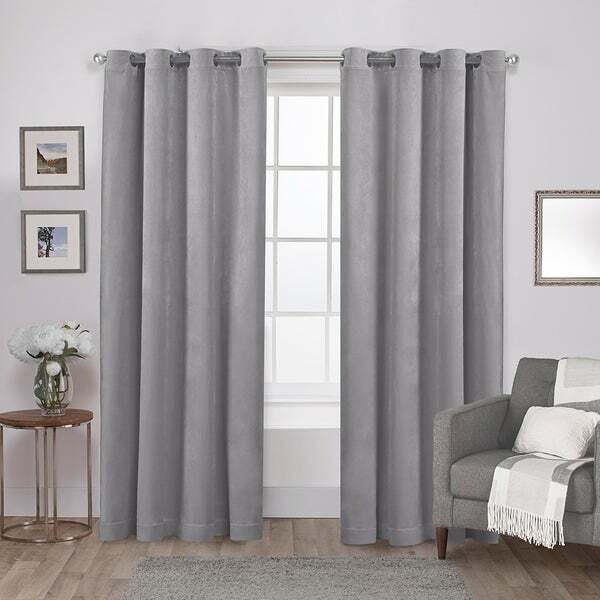 These curtains are beautiful and soft as well as heavy and durable. My only complaint is the color was a lighter shade then what the photo depicts. I was able to use fabric dyes to get it the color I wanted. I love the weight and quality of these curtains. They are absolutely perfect! These are actually not very heavy weight - I found that a lot of light was still shining through even with the shutters closed behind them. I am planning to send these back and look for another pair on this amazing site! Nice material.. wish it was thicker for the black out purpose. I can always add in another layer behind to make it darker for when I need sleep during the day Time. But great price for the item. I love these drapes. They are fabulous. Excellent quality for a great price. I purchased the burgundy color and they are not quite burgundy, more like a dark dusty rose. Not a deal breaker, they are absolutely worth the money, but I am bummed they are not the dark burgundy as pictured. "Has there been any issues with these curtains discoloring with the sun. I am in Georgia with windows facing south. V/r, AW"
"Which one is the soft grey as the colour does not show under the picture"
"The product description says panel pair, but the specs say 1 panel. Which is it? 2 panels or 1?" This is sold as a single panel.